This Rawlings official Major League baseball has been personally hand signed and inscribed "HOF 99". 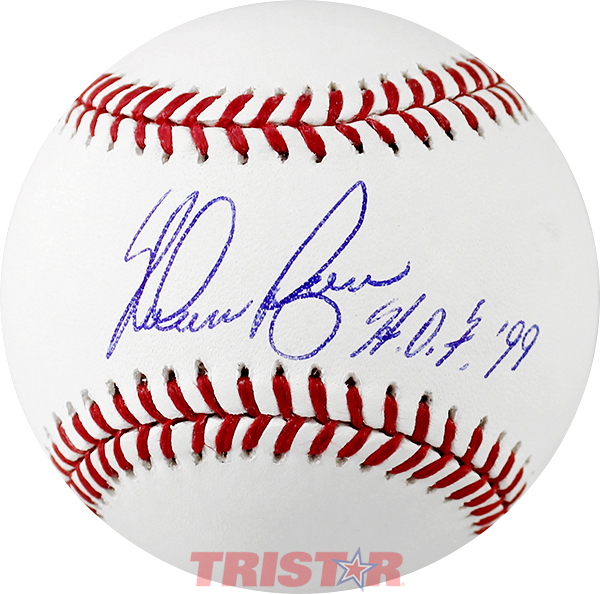 Each autographed baseball includes an individually numbered, tamper-evident TRISTAR Authentic hologram, which can be verified online at www.tristarauthentic.com. Nolan Ryan was a pitcher in the MLB for 27 years. During his career, the Hall of Famer appeared in eight All-Star Games, contributed to a World Series Championship, and was an 11-time Strikeout Champion. He still holds the record for most strikeouts and most no hitters in a career. Ryan was named to the MLB All-Century Team and became a member of the Baseball Hall of Fame in 1999.